Epiphany: this word indicates the manifestation of the Lord, who, as Saint Paul tells us in the second reading (cf. Eph 3:6), makes himself known to all the nations, today represented by the Magi. In this way, we see revealed the glory of a God who has come for everyone: every nation, language and people is welcomed and loved by him. It is symbolized by the light, which penetrates and illumines all things. Yet if our God makes himself known for everyone, it is even more surprising how he does so. The Gospel speaks of a hum of activity around the palace of King Herod once Jesus appears as a king. 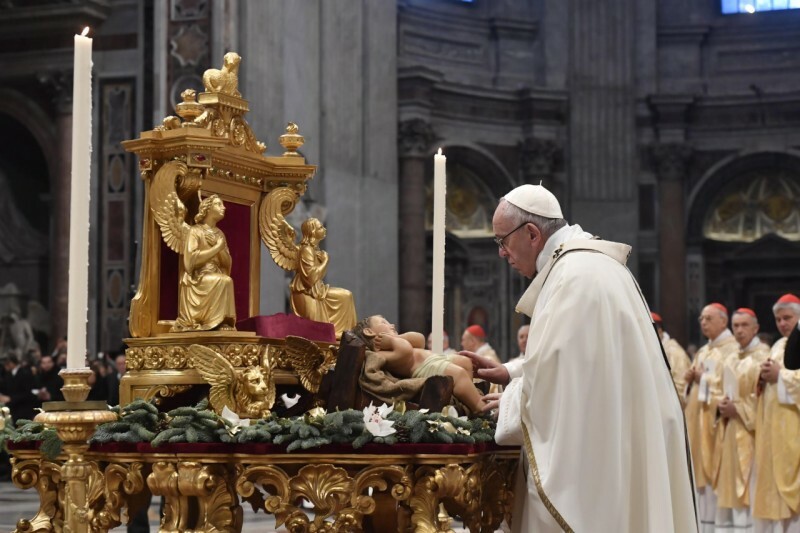 The Magi ask: “Where is the child who has been born king of the Jews?” (Mt 2:2). They will find him, but not where they thought: not in the royal palace of Jerusalem, but in a humble abode in Bethlehem. We saw this same paradox at Christmas. The Gospel spoke of the census of the entire world taken in the days of the Emperor Augustus, when Quirinius was governor (cf. Lk 2:2). But none of the great men of that time realized that the King of history was being born in their own time. Again, when Jesus, some thirty years of age, made himself known publicly, preceded by John the Baptist, the Gospel once more solemnly situates the event, listing all the “magnates” of the time, the great secular and spiritual powers: Tiberius Caesar, Pontius Pilate, Herod, Philip, Lysanias, the high priests Annas and Caiaphas. And it concludes by saying that, at that time, “the word of God came to John, the son of Zechariah, in the wilderness” (Lk 3:2). To none of the magnates, but to a man who had withdrawn to the desert. Here is the surprise: God does not need the spotlights of the world to make himself known. When we listen to that list of distinguished personages, we might be tempted to turn the spotlight on them. We might think that it would have been better had the star of Jesus appeared in Rome, on the Palatine Hill, where Augustus ruled over the world; then the whole empire would immediately have become Christian. Or if it had shone on the palace of Herod, he might have done good rather than evil. But God’s light does not shine on those who shine with their own light. God “proposes” himself; he does not “impose” himself. He illumines; he does not blind. It is always a very tempting to confuse God’s light with the lights of the world. How many times have we pursued the seductive lights of power and celebrity, convinced that we are rendering good service to the Gospel! But by doing so, have we not turned the spotlight on the wrong place, because God was not there. His kindly light shines forth in humble love. How many times too, have we, as a Church, attempted to shine with our own light! Yet we are not the sun of humanity. We are the moon that, despite its shadows, reflects the true light, which is the Lord. He is the light of the world (cf. Jn 9:5). Him, not us. The light of God shines on those who receive it. Isaiah, in the first reading (cf. 60:2), tells us that that light does not prevent the darkness and the thick clouds from covering the earth, but shines forth on those prepared to accept it. And so, the prophet addresses a challenging summons to everyone: “Arise, shine” (60:1). We need to arise, to get up from our sedentary lives and prepare for a journey. Otherwise, we stand still, like the scribes that Herod consulted; they knew very well where the Messiah was born, but they did not move. We also need to shine, to be clothed in God who is light, day by day, until we are fully clothed in Jesus. Yet to be clothed in God, who like the light is simple, we must first put aside our pretentious robes. Otherwise, we will be like Herod, who preferred the earthly lights of success and power to the divine light. The Magi, instead, fulfil the prophecy. They arise and shine, and are clothed in light. They alone see the star in the heavens: not the scribes, nor Herod, nor any of the inhabitants of Jerusalem. In order to find Jesus, we also need to take a different route, to follow a different path, his path, the path of humble love. And we have to persevere. Today’s Gospel ends by saying that the Magi, after encountering Jesus, “left for their own country by another road” (Mt 2:12). Another road, different from that of Herod. An alternative route than that of the world, like the road taken by those who surround Jesus at Christmas: Mary and Joseph, the shepherds. Like the Magi, they left home and became pilgrims on the paths of God. For only those who leave behind their worldly attachments and undertake a journey find the mystery of God. This holds true for us too. It is not enough to know where Jesus was born, as the scribes did, if we do not go there. It is not enough to know that Jesus was born, like Herod, if we do not encounter him. When his place becomes our place, when his time becomes our time, when his person becomes our life, then the prophecies come to fulfilment in us. Then Jesus is born within us. He becomes the living God for me. Today we are asked to imitate the Magi. They do not debate; they set out. They do not stop to look, but enter the house of Jesus. They do not put themselves at the centre, but bow down before the One who is the centre. They do not remain glued to their plans, but are prepared to take other routes. Their actions reveal a close contact with the Lord, a radical openness to him, a total engagement with him. With him, they use the language of love, the same language that Jesus, though an infant, already speaks. Indeed, the Magi go to the Lord not to receive, but to give. Let us ask ourselves this question: at Christmas did we bring gifts to Jesus for his party, or did we only exchange gifts among ourselves? from the first place and to recognize our neediness, the fact that we are not self-sufficient. Then there is frankincense, which symbolizes a relationship with the Lord, prayer, which like incense rises up to God (cf. Ps 141:2). Just as incense must burn in order to yield its fragrance, so too, in prayer, we need to “burn” a little of our time, to spend it with the Lord. Not just in words, but also by our actions. We see this in the myrrh, the ointment that would be lovingly used to wrap the body of Jesus taken down from the cross (cf. Jn 19:39). The Lord is pleased when we care for bodies racked by suffering, the flesh of the vulnerable, of those left behind, of those who can only receive without being able to give anything material in return. Precious in the eyes of God is mercy shown to those who have nothing to give back. Gratuitousness! In this Christmas season now drawing to its close, let us not miss the opportunity to offer a precious gift to our King, who came to us not in worldly pomp, but in the luminous poverty of Bethlehem. If we can do this, his light will shine upon us.